Take a peek into the heavens on Wednesday night and you may get a glimpse of the Lyrid meteor shower, which this year coincides with the Earth Day. The stunning celestial display could see as many as 100 meteors pass by every hour. 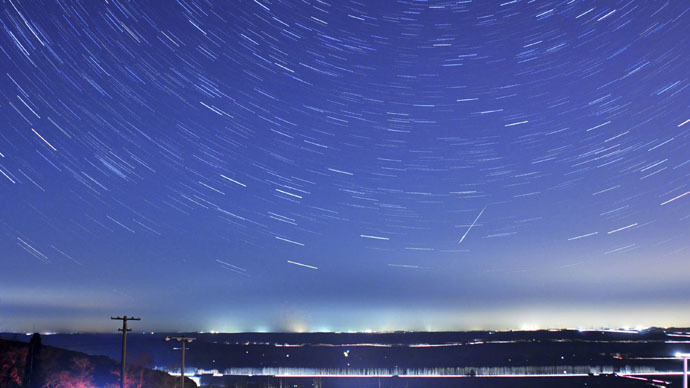 The meteor shower will light up the night’s sky from April 16 to 25, but the best views will occur on the night of April 22-23. Astronomers say that normally between 10 and 20 meteors should be visible every hour, thought this could rise to around 100 meteors in the space of 60 minutes. Leaving urban centers to escape light pollution will give stargazers the best views, but there is no need for any expensive telescopes or binoculars, as the show can be seen with ones own eyes. The annual April Lyrids are only visible as the Earth passes through the tail of the Thatcher Comet towards the end of the month, with the bright streaks of lights being particles from that comet. It is one of the oldest known astronomical events, which has been visible for more than 2,600 years. In 1982, stargazers counted up to 90 meteors passing every hour.